You can store two driver’s seat (except for power lumbar), steering wheel and door mirror positions with the driving position memory system. 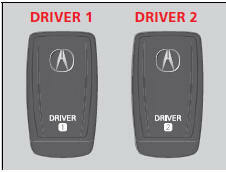 When you unlock and open the driver’s door with a remote transmitter, or keyless access system, the seat and door mirrors adjust automatically to one of the two preset positions. The steering wheel will move to the stored position when you set the power mode to ACCESSORY. Using the audio/information screen or multiinformation display, you can disable the automatic seat, steering wheel and door mirrors adjustment function.